All rates are effective January 1st, 2019 unless otherwise noted. A question we are often asked is in regards to the timing of the rate change. A rate change takes place on January 1st, means that it is for work performed on or after that date. It is not based on the date the wages are paid. For example, if your biweekly pay period is from 12/18/2018 to 12/31/2018, with a check date of January 5th, 2019, all of those hours worked would be paid at the 2018 rate, even though it is being paid in 2019. A situation occurs when your pay period straddles two different calendar years, and a few days needs to be paid at the old rate and a few days at the new. This may cause a nightmare of work if your timekeeping/payroll system cannot handle assigning rates based on the day worked. The easiest solution would be to pay the entire pay period at the new rate. Yes, one may see this as ‘overpaying’ the employees, but in most cases the added administrative work involved may overshadow the additional wages paid. With PayMaster HCM time & labor and payroll, rates are assigned on a daily basis, so mid-pay period rate changes are never an issue. The following 21 states are all remaining at the Federal minimum wage level of $7.25. A rate that has been in place since July 24th, 2009. Alabama, Georgia, Idaho, Indiana, Iowa, Kansas, Kentucky, Louisiana, Mississippi, New Hampshire, North Carolina, North Dakota, Oklahoma, Pennsylvania, South Carolina, Tennessee, Texas, Utah, Virginia, Wisconsin, Wyoming. A final note. If your state has enacted a rate change, this means that you will need to update your state labor poster. 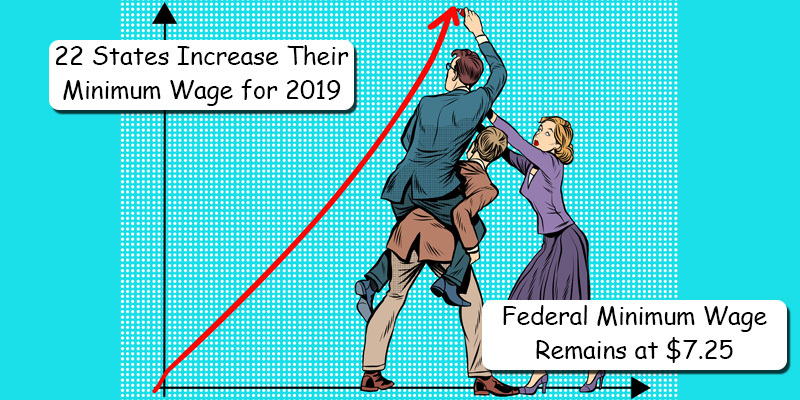 If your state is not listed, check with your state’s department of labor to confirm there was no rate change for 2019. The data listed is for general informational purposes only and should not be used as legal or professional advice. Please contact your state and local agency for more information regarding your State Minimum Wage as well as any exceptions that may exist.